Pat Thode Hand-painted Needlepoint Canvases. 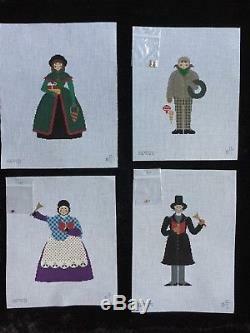 Seven wonderful designs make up this fabulous Caroler Series! 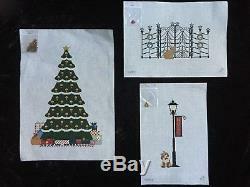 In the first photo are the Christmas Tree, the Cat & Gate, and the Dog & Lamppost. In the second photo are Emily Bristol, Oliver Crisp, Miss Biddy Twizzleberry, and Reverend Chester Smalley. 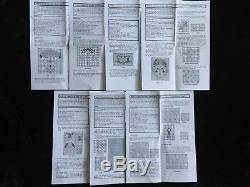 Included is a stitch guide for each design as shown in the third photo. All designs have a small plastic bag with tiny charms to be attached as embellishments; only one design, Emily Bristol, is missing its charm. Canvas sizes vary according to the design. Design size is approximately 3 1/2 x 6 inches for the smallest Caroler, and 5 x 6 1/4 inches for the largest Caroler, 3 x 8 inches for the Dog & Lamppost, 8 1/2 x 4 1/2 inches for the Cat & Gate, and 8 1/2 x 12 inches for the Christmas Tree. They have lived in a smoke-free environment. I believe there are other Carolers that were designed as part of this series, but I have not found any of them currently available anywhere. The item "Pat Thode Set of 7 Hand-painted Needlepoint Canvases Caroler Series With SG" is in sale since Monday, October 1, 2018.